Superb songs and the title music has snippets from "paalki chaley" !. 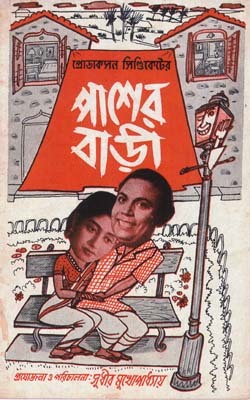 Records for the first four songs were released back in the 50s and thanks to the record collectors, HMV could release all the four songs in that four-volume cassette of Salil's Bengali Film songs - Chayonika Vol II. A must have for Salil admirers. It was 'Jhir jhir jhir jhiir jhiri barosa' which changed the course of Bangali modern songs and Bengalees were just amazed. It was the beginning of Salil's long journey as the most original & talented composer and lyricist. In the difficult to find and rarher jumpy VCD we could find the 5th song but not the singer's identity. Besides this song there is a unique version of "Gnaayer Bodhu" which is sung in different keys (scales) and snippets of two short songs.